What You Get | WEEKEND HANDICAP | Make your game better and prove it! New Zealand Golf, Leisure and Lifestyle Magazine is this country’s leading monthly golfing publication. Packed with world and local golf stories written by professional writers and rounded with travel, cars and the NICE things in life. Their aim is to provide golf, leisure and lifestyle information to all their readers. They give you access to expert commentary, tips, views and are fortunate to be able to give you access to some very attractive specials and deals. We hope these three FREE issues gives you an introduction to the advantage of being a part of the New Zealand Golf Magazine family. Play golf off what you should be, rather than plucking a number out of the air. A golf handicap is designed to allow all golfers to compete fairly on a level playing field. If your whole group has a handicap it makes the golf day more enjoyable, as all golfers will have a fair and square chance of winning. Don’t quite have enough time to play 18 holes? No problem, just submit a nine hole round. Then when you play another nine hole round the two will be paired together as if they comprised the two halves of an 18 hole round, which will then be figured into your handicap. We’ve arranged great green fees at selected golf courses all around NZ. You can play at any course in the country, but by teeing-off at our supported golf clubs it’s more affordable, so you can play more golf. Some clubs have reduced their fees by more than half. In most cases you’ll cover the cost of our membership in two or three rounds. For example, play Miramar Golf Club in Wellington and pay only $30.00 mid-week and $40.00 on the weekends instead of $65.00! Bridge Par in Hastings is only $40.00 mid-week and $55.00 on the weekend instead of $80.00! Marcus Wheelhouse is a former touring golf professional, now a teaching professional at JK’s World of Golf, who hosts corporate golf days, holds golf clinics and coaches all levels from beginners, to recreational golfers, right through to some of New Zealand’s top amateurs and professionals. He is also a television golf presenter/commentator. He appears regularly on the ANZ golf show on Sky and spent over four years hosting a weekly radio show with legend broadcaster Brenden Telfer on radio sport. 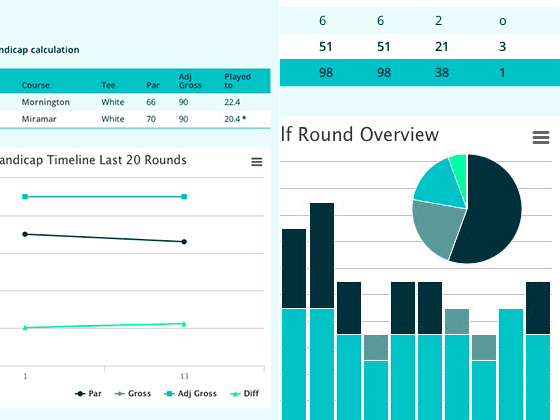 We’ve tried to make it as simple as possible to record your golf rounds. 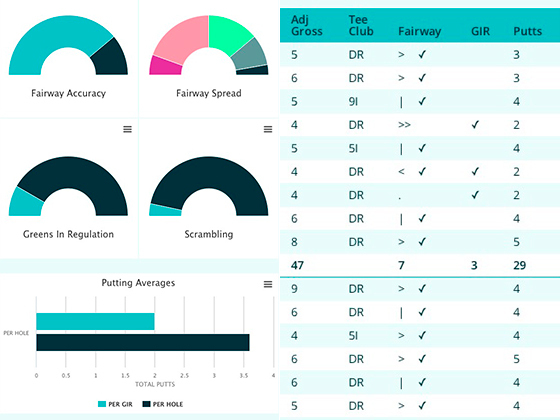 When entering your cards you can choose to enter just what you shot for each hole or you can choose to record advanced statistics, such as; what club you used from the tee, whether you hit the fairway or not, whether you hit the green in regulation and the amount of putts you took on each hole. Your recorded scores and statistics are an excellent way to see where and when your game needs work. Check out our demo and screen shots below to see how easy it is for our members to sign-in and start entering cards.